One of the largest yachts on display at FLIBS 2017, Vanish was delivered by Feadship in May 2016, sporting exterior styling by Harrison Eidsgaard and De Voogt Naval Architects. 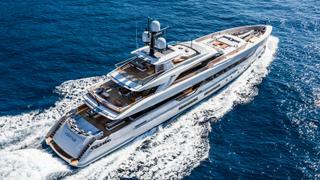 Key features include a pair of superyacht helipads, situated fore and aft, as well as a globetrotting range of 5,200 nautical miles when cruising at 12 knots. With the goal of re-imagining the flybridge yacht, Adler Yacht, a new Swiss brand, brought together German and Austrian engineers and Italian designers and craftsmen. The result is the 23.09 metre Adler Suprema, which shows plenty of fresh thinking, with lightweight carbon construction and hybrid propulsion that allows silent cruising up to 10 knots, a 28 knot top speed in diesel mode and 50 per cent fuel savings over conventional set-ups. 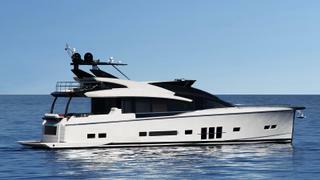 Inspired by her little sister the 66 GLX, which made its debut at Yachts Miami Beach last year, the Astondoa 80 GLX inherits the same large side windows. 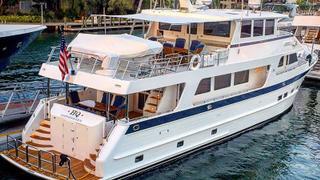 This revamped rendition showing in Fort Lauderdale also boasts a reconfigured flybridge and new interior palette of warm colours and materials. She’s fast, too, topping out at 31 knots. Book Ends is a classic, luxurious yacht with timeless exterior lines matched by a rich interior, both designed by some of the industry’s best. Her performance is also superlative; her MTU 8V 4000s pushed her beyond the contractual top speed, reaching 15.6 knots during sea trials. Although she is hull number 11 in the ISA Sport 120 series, Clorinda is very much a different animal to her predecessors. This 36 metre fast cruiser is the first yacht to be launched since the Ancona-based yard was acquired by the Palumbo Group in August 2016. 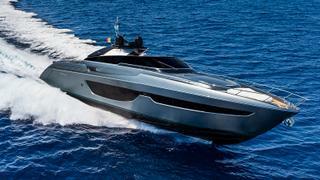 The new parent company brought in Enrico Gobbi Team For Design to further refine her styling. Notable tweaks include dark tinted glass inserts in the superstructure, a side-loading tender garage and a skylight in the master suite. 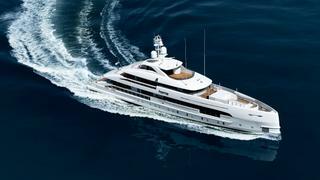 A 2016 launch for German yard Abeking & Rasmussen, 72 metre Cloudbreak looks set to steal the show at the Fort Lauderdale International Boat Show 2017. Currently offered for charter, this Espen Øino-designed yacht was built to take on the world, with a fully-certified helideck, ski room and truly impressive tender garage. 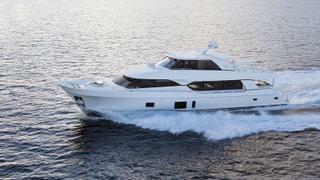 The M90 Panacera’s styling makes it an instantly recognisable member of Hatteras’ Motor Yacht family. 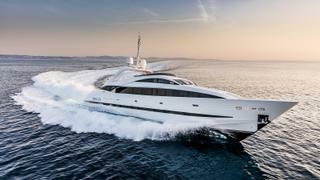 The open-concept interior includes a new option: the builder’s first hydraulic superyacht balcony, and the atrium skylight first shown on the M75 is even bigger here, filling the interior with light. The M90 also introduces the HattCON ship management system, which integrates navigation, monitoring and automation functions into a simple touchscreen. Unveiled two years ago as Project Nova, Home is a ground-breaking vessel for Heesen, combining a fuel-efficient fast displacement hull with hybrid propulsion. Electric shaft motors silently push Home to nine knots without the main engines. With mains on, they act as generators, providing enough power for hotel loads. Styling is cutting edge, inspired by a beach villa and emphasising a close connection to the sea with large expanses of glass. Horizon’s new FD range represents a styling departure for the Taiwanese builder, with a plumb bow and floor to ceiling windows fronted by cut-out bulwarks for even bigger views out. The fast displacement hull gives the Horizon FD85 efficiency over a range of speeds and her wide beam means tremendous interior volume. 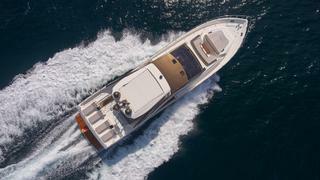 Hull No 3 will be in the US and it features a main deck master and warm anigre and walnut throughout. 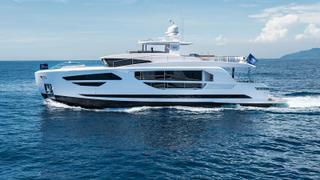 The yard is also exhibiting its latest Horizon RP110 yacht at FLIBS 2017. Outer Reef has found great demand for this 860 Deluxbridge Skylounge model, as long distance cruisers seem to really appreciate the climate controlled, all weather, protected helm. The configuration on HQ negates the need for a lower helm, which allows for an expanded galley. 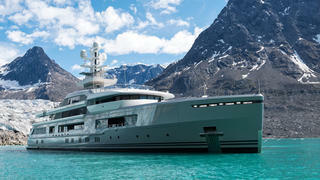 Accommodation also mimics superyachts, with four guest cabins and two crew cabins. 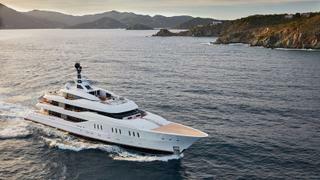 Muchos Mas is much more than a beautiful tri-deck superyacht. As the first new Crescent for more than a decade, she marks the return of the Canadian brand after a troubled period. Key features include a foredeck spa pool, a main saloon bar that extends to the aft deck and four guest cabins in addition to a spacious main deck master. The newest Damen Yacht Support vessel, New Frontiers has the huge deck space and crane necessary to carry every conceivable tender and toy, but she has something new, too: guest accommodation. 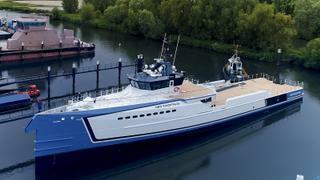 For the first time, Damen included an owner’s lounge and guest quarters for six on the main deck. 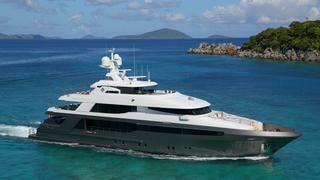 The Dutch yard will also be exhibiting Axis, which was at FLIBS last year under her original name Fast & Furious and has since been refitted to add guest accommodation. The first five-cabin version of the model that was introduced in 2014, this hull shows the ultimate in flexible accommodation. 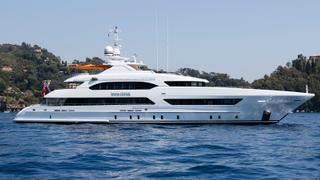 It features a main deck master with mirror VIPs and twins below. Furthermore, the twin beds slide together to make queen-size berths. The enclosed upper saloon on the Ocean Alexander 100 Skylounge offers even more volume, giving a lot of room for yacht of this size. 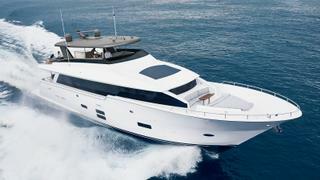 British builder Pearl Yachts will unveil its new flagship yacht at this year’s Fort Lauderdale International Boat Show. Featuring a spacious flybridge, oversized windows, a full-beam master, a foredeck lounge and a PWC garage, the Pearl 80 is packed with big-boat amenities. Following in the wake of her big sister, the Riva 88 Florida, the 32-knot 76 Bahamas features the super cool convertible 'C-Top' that transforms her from an open to a coupe. A carbon fibre hardtop lifts out of the forward cowling, revealing a foredeck seating area, and comes to rest between the windshield and roll bar. Inside, Riva style pervades with white veneer, dark leather and stainless steel accents. 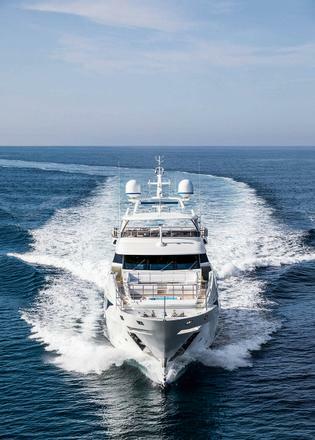 It’s not just the wave-piercing bow and displacement to planing hull that sets the Benetti Fast range apart. It’s also the innovative propulsion system developed by Rolls-Royce, featuring a steerable thruster — the Azipull Carbon 65. 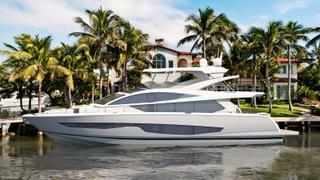 The third hull in the Fast 125 series, Skyler will shows off this technology at the Fort Lauderdale International Boat Show, along with RWD’s ‘Air’ interior, one of the three styles available to owners. 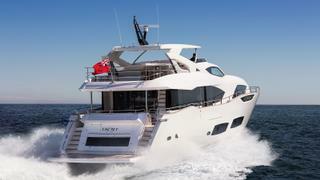 An innovative layout is the hallmark of the Sunseeker 95 Yacht. Thanks to a raised pilothouse that frees up space on the main deck, there is a generous forward master suite configured on three levels. Stairs lead down to a mid-level dressing area then to an en suite below. Tankoa’s second launch uses every bit of her 499GT interior for such amenities as a beach club gym, a master and VIP on the main deck, an upper deck home movie theatre and a seven metre tender garage. Constructed in aluminium with a full displacement hull, Vertige has a timeless look and includes floor to ceiling windows with cut-out bulwarks for maximum views from within.